I am not going to go into tiling a hearth in detail for now – there are plenty of articles on cutting and applying tiles. Almost any tiles will do – remember they have been in a kiln so will be able to resist the heat of a stove! (I often get asked if tiles have to be special heat proof versions). 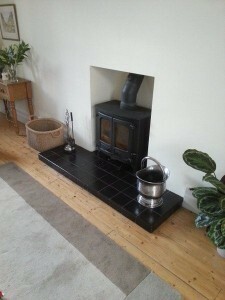 You can purchase proper hearth tiles (bevelled edges) and these can be seen in the picture on the left. Create a concrete hearth (use wooden shuttering to box the mix in then remove when the concrete is dry). What I then do is dot and dab a sheet of 7mm Hardiebacker concrete board to the top of the concrete hearth (use a spirit level and make sure you PVA both surfaces, concrete and Hardiebacker). The concrete board gives you a perfectly flat surface on which to tile (always PVA concrete board). Grout. Leave to dry. Voila!